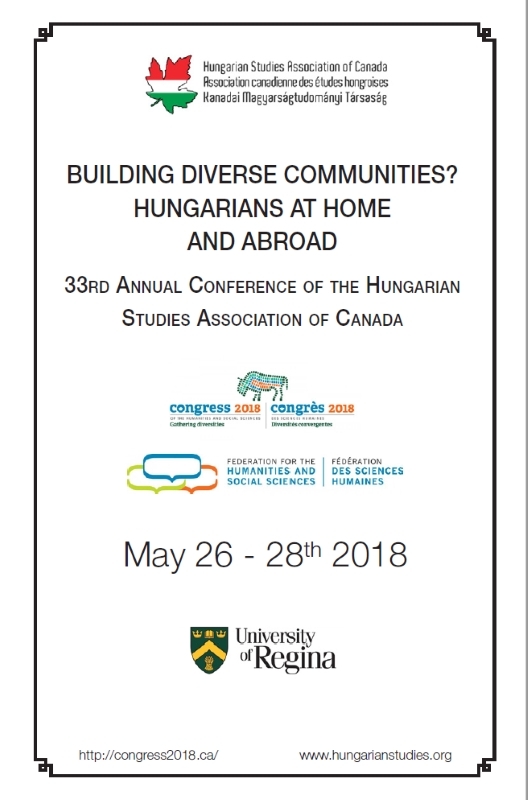 The Hungarian Studies Association of Canada invites proposals for individual papers or complete panels for our annual conference to be held in conjunction with the Congress of Social Sciences and Humanities at the University of Regina, May 26-28 2018. As in years past we will consider proposals on any topic related to Hungary and Hungarian Studies, though in keeping with the Congress theme “Gathering Diversities” we especially encourage presentations that deal with questions of community, not just in Hungary and its surrounding region, but also within the Hungarian diaspora. We invite presenters to think broadly about the ways in which Hungarians have gathered in the past, how they organize themselves and think about community in the present and the future, and how they have sustained themselves-and continue to sustain themselves-individually and collectively in communities of various types over both the short and long term. We also encourage papers that help us to think more critically about the idea of community itself, and about how communities are built and maintained on the local, national, and/or transnational level. In addition, we welcome papers that explore issues of diversity at home or abroad. Beyond looking at how Hungarian emigrants have contributed to the diversity of communities in Canada and other countries around the world, we especially encourage papers that look critically at the notion of pluralism itself, and at how diversity has been managed at the local, national, and/or international level. Given the current discussions in Hungary around notions of diversity, and questions surrounding global migration and the future of the European Union, papers on such topics would be of particular interest. Please note: our Sunday (May 27) program will consist of an all-day trip to see two of the most significant sites of Hungarian settlement in Canada: Kaposvar Historic Site (Roman Catholic stone church and complex near Esterhazy, Sask.) and Bekevar Presbyterian Church Historic Site (near Kipling, Sask.). The trip will include tours of both historic sites with lunch in Esterhazy (plus coffee/dessert at a nice cafe) and dinner in Kipling at a home-style restaurant. We would leave at 9 AM and arrive back in Regina by 9:30 PM. There will be opportunities in both locations to present conference papers. Submissions should include a maximum 300 word abstract and a brief 100 word bio which can be used to introduce the speaker. Since both the abstract and the bio will be published online, they should be prepared in Word format using Times New Roman font 12. Abstracts should be sent electronically both to the Chair of the Program Committee, Steven Jobbitt(sjobbitt@lakeheadu.ca) and to the Secretary of HSAC, Judy Young (judyyoung@drache.ca). Proposals are preferred in English or French but will also be accepted in Hungarian if an English language abstract is also provided. Presentations at the conference are no longer than 20 minutes with an additional 5-10 minutes for discussion. The deadline for submission is January 15, 2018. We will notify authors of the Committee’s decisions by January 30, 2018.